The way to an ideal figure, and especially to a flat stomach, is thorny. But, if you stick to proper nutrition and train hard, then there should not be any problems. Getting a flat stomach and a thin waist is not easy. This problem is especially familiar to already middle-aged women who are trying their best to keep weight and shape. But we are ready to assure you that nothing is impossible. The main thing is to practice correctly. 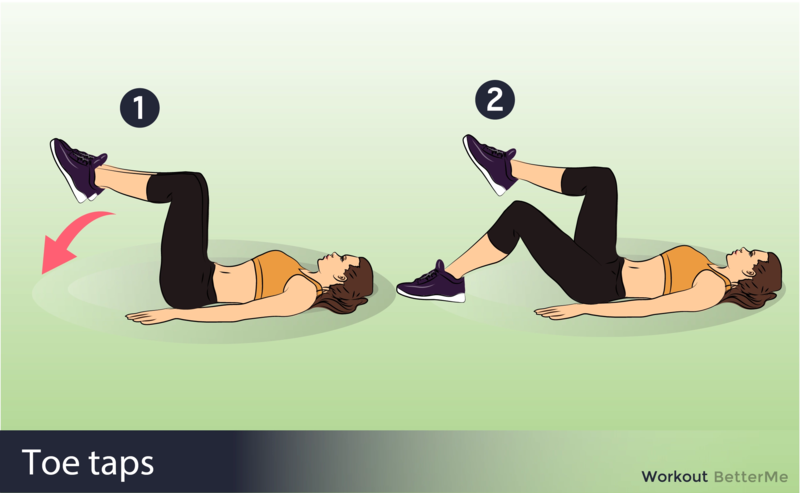 We have prepared a set of exercises to make your stomach flat. All of them were carefully selected to achieve the maximum result. You should do the next: Squats With Kickbacks, Toe Taps, Donkey Kicks, Jump Squats, Bird Dog, Mountain Climbers, Heisman, Side Plank Dips. Do this workout three times a week. It will take no more than 10-15 minutes, but the results will be great. - Stand with your feet touching. Hold your hands comfortably in front of your chest or on your hips, and bend your knees, lowering your hips deeply so your thighs are parallel with the floor. Be sure to keep weight back in your heels. - Then rise back up, straightening the legs completely, and lift the left leg behind you for a back kick. Lower the foot back to the floor in a narrow squat position. - Do another squat and then straighten the leg. Do a back kick with the right leg, and step the right foot back to meet the left. - Begin by laying flat down over the padding facing upwards. Make sure legs are bent at the knees and feet are flat on the ground. Your hands should be flat at your sides. - Begin by contracting your hamstrings, driving up your upper legs while flexing your core. Try to keep feet off of the ground while simultaneously switching feet to stagger resistance. Try not to cheat with your feet on the ground during this exercise. - Movement is complete once you cannot lift the leg any further. This will usually happen as a result of your muscles being fully stretched. 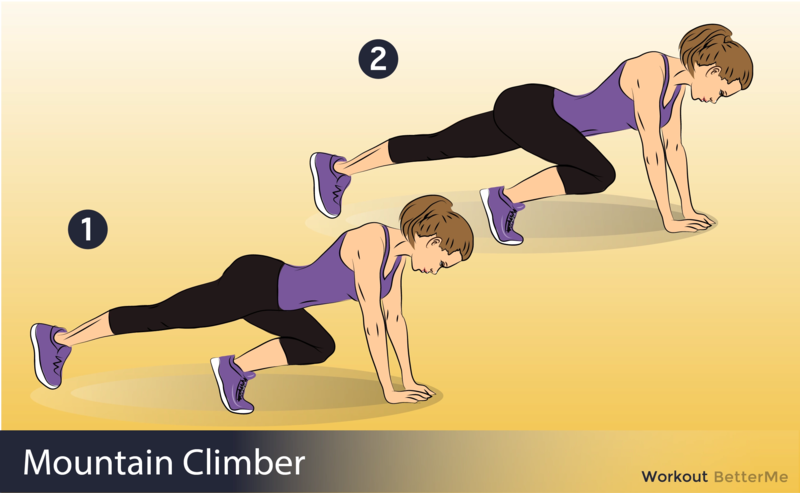 - Start on all fours, with your hands directly under your shoulders and your knees directly under your hips. - Keep your right knee at a 90-degree angle as you slowly raise your leg behind you until your thigh is almost parallel to the floor. - Pulse your flexed foot toward the ceiling by squeezing your glutes. Your back should remain perfectly still in a neutral spine. The motion should be small and controlled with the muscle doing the work and not momentum. 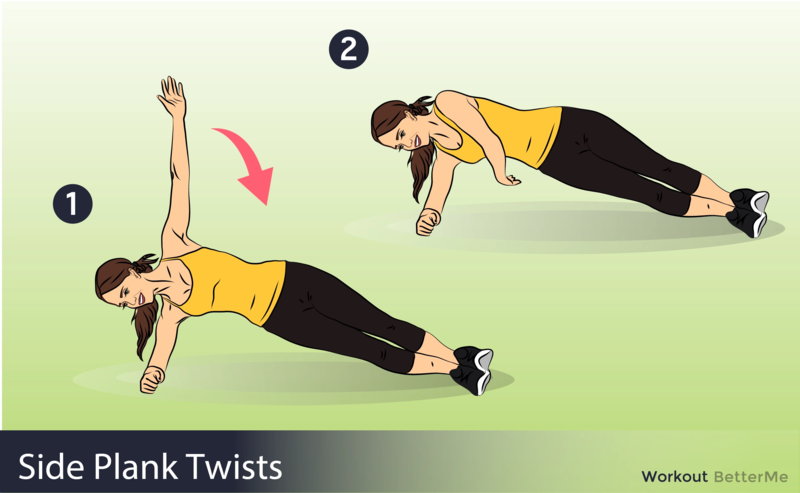 - Begin in a pushup position, with your weight supported by your hands and toes. - Flexing the knee and hip, bring one leg until the knee is approximately under the hip. This will be your starting position. 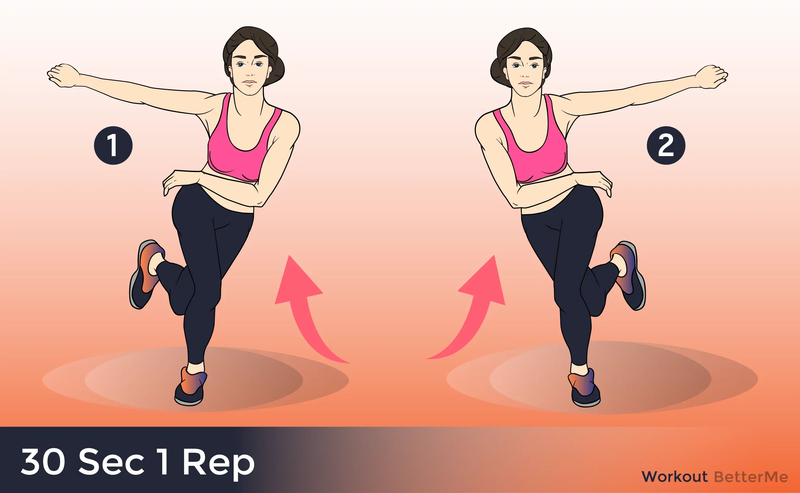 - Explosively reverse the positions of your legs, extending the bent leg until the leg is straight and supported by the toe, and bringing the other foot up with the hip and knee flexed. Repeat in an alternating fashion for 20-30 seconds. - Alternate from leg to leg, and add a hop in between each repetition to make the exercise more challenging. - Begin in a side elbow plank on your right side with straight legs and your feet stacked. - Inhale and lower your pelvis to the floor, so your right hip hovers just off the floor. Exhale and press up through your right waist to lift your pelvis and return to side plank. Pull your right shoulder blade down your back to stabilize your shoulder. - Repeat for a total of 10 to 15 reps to complete a set, then switch sides. Do three sets.